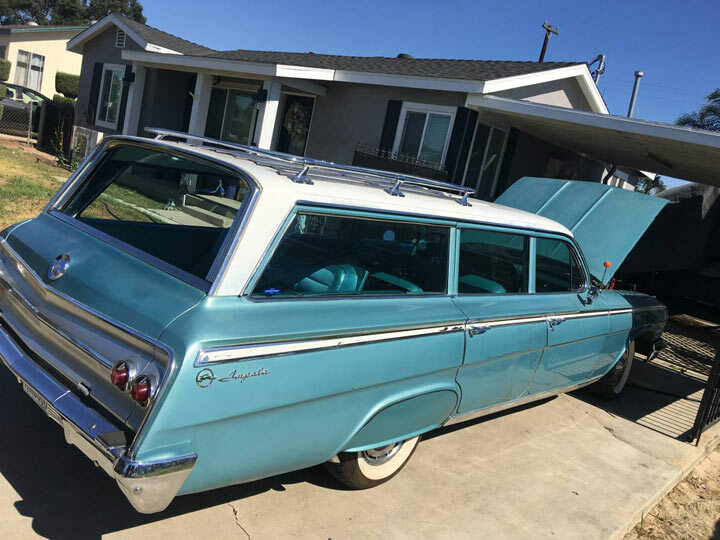 The options list starts with working factory AC, a rare and expensive upgrade in 1962. 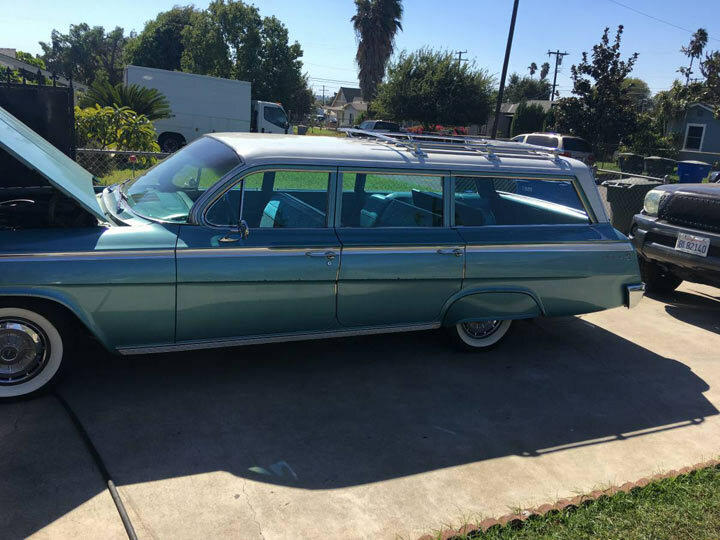 Also added was Powerglide, power steering and brakes, power windows, cruise control, push button radio, hazard flasher, two-tone paint, luggage rack, bumper steps, an 80/20 back seat and a third seat bringing the passenger capacity up to 9 passengers. 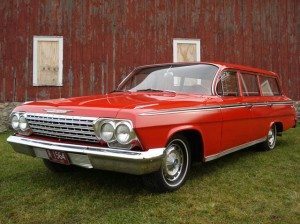 Other than opting for a 327 or 409 engine there really wasn’t much more you could’ve added to a 1962 Impala. 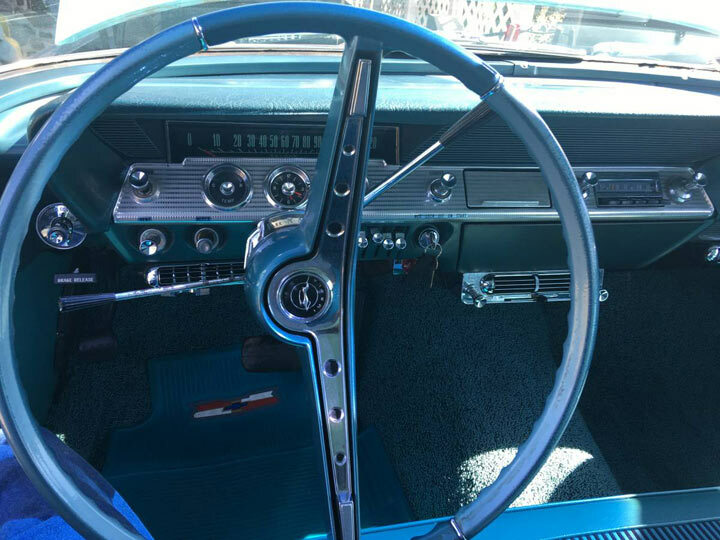 The interior is very impressive and let me remind you all original. 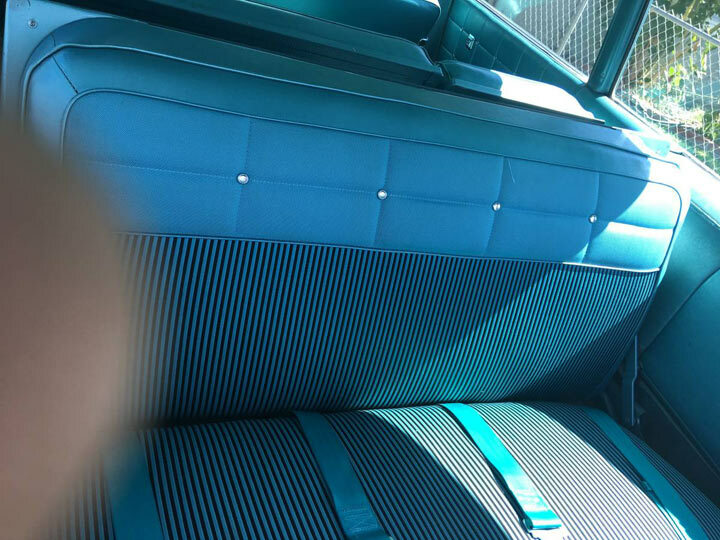 Chevrolet had some of the nicest cabins in 1962 anyway and the aqua colors they offered in the early 60’s always seemed to work so well. 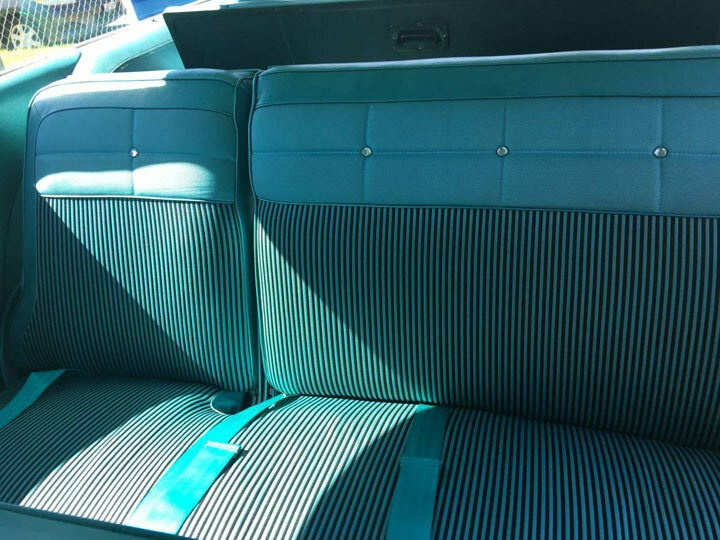 The only issues I could find with the interior are with the armrests that have peeling vinyl but this is an easy fix as material is readily available. Although there’s some nice paint gloss in areas fresh paint will bring this Impala to another level. Luckily the body looks to be very straight and rust free so while a quality paint job is always a big expense, the solid body will save a of prep work. It seems to me that fender skirts are always polarizing- people love ’em or hate ’em but think they’re a fantastic touch on this Impala. 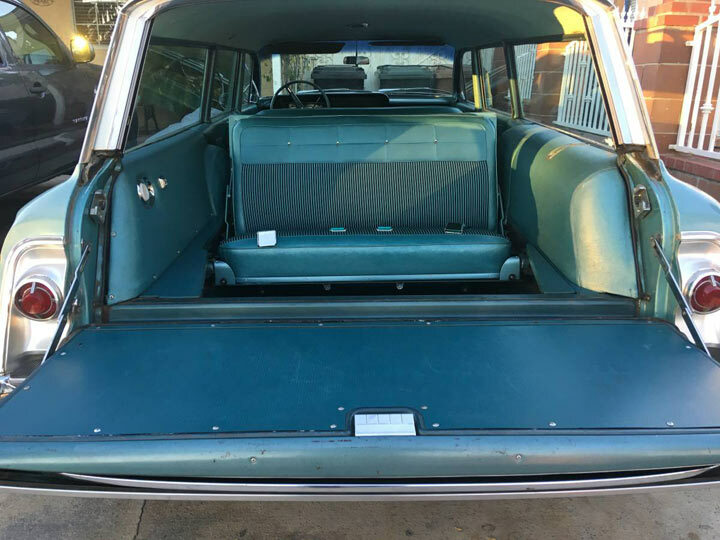 I grew up with Impala wagons and this back seat is really bringing back memories. 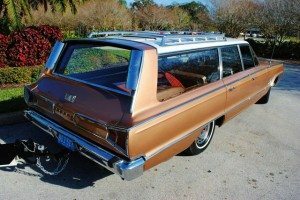 Having two older sisters, the back seat of our Impala wagon was my refuge! The Chevy 283 was good for a 170hp, and while not a high horse power performer, they are solid and reliable engines. 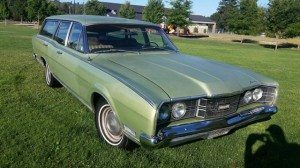 The seller states the the car runs and drives well but doesn’t elaborate on any issues or mechanical work done. The engine bay looks to be pretty much untouched and a simple cleaning would likely do wonders. 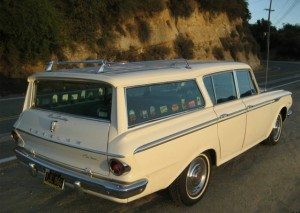 With its original condition and list of desirable options is this the kind of wagon you’d like to have in your garage? What is the silver thing on the engine with the orange sticker on it? To Kurt….I’m pretty sure that is cruise control. Yes,Steve I agree. It certainly does appear to be the rare Chevrolet “Speedminder” cruise control setup. Very nice ’62 & then some!! 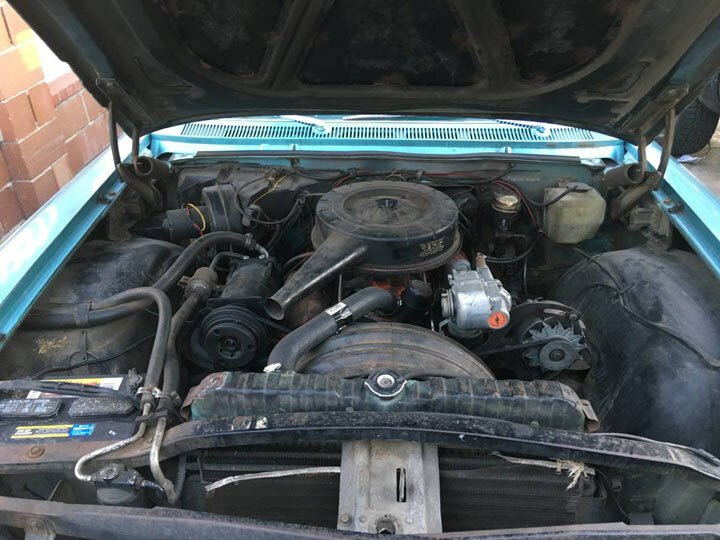 Btw, always thought by ’62 the 283 was already up to 195 hp. Not absolutely positive though.